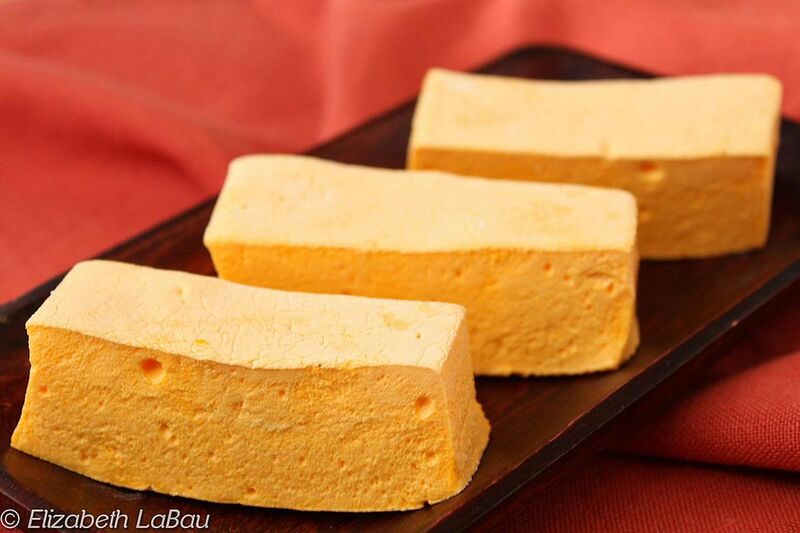 This Mango Marshmallows recipe produces tender, light marshmallows bursting with vibrant mango flavor. They're a great change from traditional vanilla marshmallows, and you can enjoy them plain, dip them in chocolate, or use them for s'mores! This recipe calls for mango puree. You can use fresh mango pureed in a blender or food processor, or for convenience, you can use frozen mango puree. If you do use the frozen mango, be sure that it is defrosted and at room temperature before using it in this recipe. Prepare a 9x13” pan by lining it with aluminum foil and spraying the foil with nonstick cooking spray. Combine the powdered sugar and cornstarch in a small bowl, and generously sprinkle the bottom and sides of the prepared pan with the sugar/starch mixture. Set aside the remaining sugar and starch for later use. Place ½ cup of cold water in the bowl of a large stand mixer fitted with the whisk attachment. Sprinkle the gelatin on top of the water, and stir to distribute the gelatin. Allow it to stand while you prepare the sugar syrup. In a small saucepan over medium heat, combine the granulated sugar, corn syrup, salt, and ½ cup of water. Stir until the sugar dissolves, then insert a candy thermometer. Cook, without stirring, until the mixture reaches 245 degrees. Once it reaches 245 degrees, remove the pan from the heat. Turn the mixer to low, and while the mixer is running, slowly pour the hot syrup into the mixer bowl over the gelatin. Be careful, as the syrup is extremely hot. If you have a large (at least 3 cup) liquid measuring cup with a spout, you can transfer the hot syrup to the cup before pouring to make it easier. Gradually increase the mixer speed to high. Continue to beat the marshmallow until it has tripled in volume and is extremely shiny and thick. This process will take approximately 15 minutes. You can tell it is done when you stop the mixer and lift up the beater, the marshmallow will slowly drip back down into the bowl in a thick, shiny stream. Once the marshmallow is done, add the room temperature mango puree and continue mixing until it is fully incorporated. If desired, you can add food coloring to make the marshmallows more vibrant. I recommend starting with several drops of yellow coloring, and once it is approximately the intensity you want, add a drop or two of red color to make it a light orange. After the puree and coloring is incorporated, pour the marshmallow into the prepared pan and smooth the top. Allow it to sit and firm up at room temperature for at least 8 hours or overnight. Cover your workstation with waxed paper to protect it, and liberally sprinkle the surface with the reserved sugar/starch mixture. Sprinkle the top of the marshmallow with the sugar/starch coating, and flip the marshmallow face down onto the prepared surface. Carefully peel back the foil from the marshmallow and dust the top of the marshmallow with more sugar/starch. Spray a large smooth-bladed knife with nonstick cooking spray, and coat both sides with the coating powder. Cut the marshmallow into squares, coating the knife blade with sugar/starch as needed. Roll the cut edges of the marshmallows in the coating mixture so that all sides are smooth and not sticky. To save marshmallows, store them in a dry airtight container in a temperate, dry location. Do not refrigerate them or keep them in a very humid place. If they are stored longer than two or three days, you may need to re-roll them in coating. Fresh marshmallows go stale after about a week, so these are best eaten soon after they are made. Click Here to View All Marshmallow Recipes!